Today’s companies rely more than ever on complex facility support systems to keep their critical loads operating. Down-time and the adverse affect on productivity and profitability is simply unacceptable. Mission critical facilities are complex in design and dynamic by nature. Critical grade power and air equipment are individual units which collectively support, back-up and protect the primary mission of the organization. Much thought, design, energy, and capital has been invested in the functional processes and operational sequencing of this equipment to perform as one complete inter-dependant and integrated system. Titan Power’s offers a wide range of specialized testing options, each designed for a specific purpose and performed under controlled conditions. Scheduled testing not only gives you peace of mind, but also allows you the flexibility to be proactive rather than reactive in your risk management practices. The purpose of Infrared Thermography is to identify, isolate and document abnormally warm or cool connectors, conductors, or components that may be a potential problem in electrical systems. Exceptions are normally caused by loose or deteriorated connections, short circuits, overloads, load imbalances, or faulty, mismatched, or improperly installed components. Resistive load banks are the most commonly used load banks for testing generator sets and power systems. They can provide full KW loading to the power source to completely evaluate the engine cooling, exhaust and fuel systems. They will not load the generator to its full nameplate KVA capacity at 0.8 Power Factor. In order to load the generator to its full KVA rating, reactive load banks will be required. The purpose of the test is to verify that the UPS system is performing to manufacturer’s design specifications. The test is normally performed within 72 hours after equipment installation and successful start-up. However, this test may be conducted at any point in the UPS design life to establish a benchmark (snapshot) of performance. The purpose of the test is to confirm that all facility critical emergency back-up systems perform correctly during a real-world power outage. Critical buss loads should not lose power at any point and all non-critical facility loads should re-establish within 7-10 seconds after loss of utility power. An integral part of the test is to ensure that all equipment performs a successful roll-back after re-establishing utility power. The technical team at Titan Power, together with Emerson Network Power, can deliver customized and comprehensive solutions for arc flash safety and compliance. 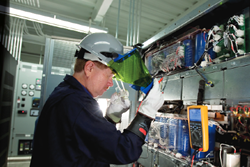 As a leader in electrical testing, maintenance and engineering services, Titan Power is equipped to provide single-point solutions for every area affecting arc flash hazards. Q: What is the most crucial regularly scheduled test to perform for a data center to keep it running smoothly? A: The most crucial test for a data center is a Facility roll-over/System test. Once the regular preventative maintenance and/or repairs have been completed on all critical equipment, it is crucial to conduct a system test, which simulates a power outage. This is usually performed annually to ensure the entire system works as it’s designed to do. However, some customers may require this be completed quarterly or monthly, depending on the criticality of their operation.